Orient Watch is a Japanese watch manufacturer that stood independent by 50 years, even after being acquired by Seiko Epson Corporation, it produces fully in-house movements and own intellectual rights of several technological innovations, like the power reserve indicator in mechanical movements. These achievements are not common in the watchmaking industry. Back in 1950 the company released the ORIENT STAR series, producing since then quality automatic watches under this label. These series, with its simple design and timeless features, has been widely popular among quality-conscious consumers. To commemorate the ORIENT STAR’s entry into the global market (1992), in the summer of 2013 was launched the ORIENT STAR Vintage Skeleton Limited Edition. Skeleton is the denomination of watches in which the moving parts are visible, this design must ensure a rigid structure although the bridge and plate have been trimmed away, so the exposed parts require additional effort in handcraft procedures for it’s finishing. This edition set has two models: the WZ0011DX with a steel gold plated (5 micron gold plating) case, champagne dial colored and dark brown leather strap, and the WZ0021DX with a stainless steel case, ivory colored dial and black leather strap. Both models had a limited worldwide production of 500 pieces. Featuring an ORIENT caliber 48E51 made in Japan (in house movement), hand winding mechanism (second hand halt mechanism), 6 beats per second with a daily accuracy of +25 ~ -15 sec and a power reserve of more then 50 hours. The case measures 39 mm (diameter) by 10,4 mm, which is rather small according to todays design standards (cases size have increased in the last decades). It has a non reflective curved sapphire crystal glass and crystal see-trough case back, which enable the movement moving parts to be exposed efficiently. 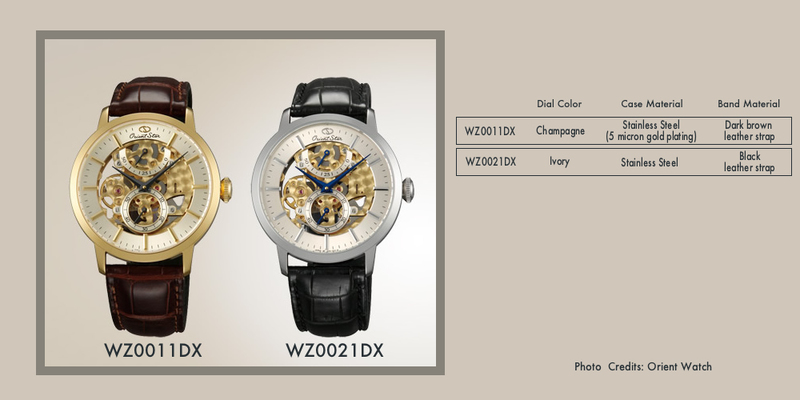 Price tag for these watches is around 1850 USD (1375 €) for the WZ0011DX and 1650 USD (1225 €) for the WZ0021DX model (excluding taxes and delivery costs). Undoubtedly quality-conscious target cost. Due to its limited production, its very difficult to find it, eBay might be an option. More detailed information about this commemorative collection can be found in the manufacturer website.